Trevor White took Mr. Pegram and I deep into the old smugglers caves in Hastings, East Sussex. He is the Attractions Manager there as well as historian and what an enthusiastic chap he turned out to be, extremely passionate about his rather special caves. Take a listen to part of the exclusive audio tour above. 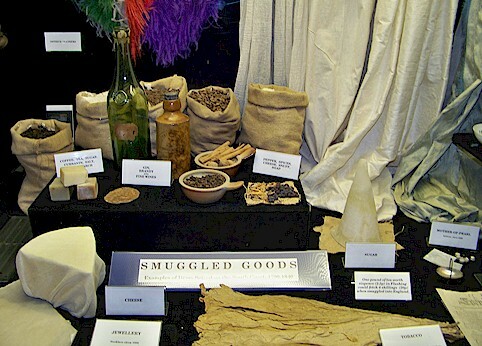 A Smugglers Adventure is an extensive exhibition about 18th Century smuggling and incorporates a museum and video theatre. The highlight of the attraction is the Adventure Walk, in which visitors travel the length and breadth of the caves, with dramatic scenes, numerous push-button effects and also a few surprises. The romantic, yet often bloody heyday of the smuggler is brought to life in this themed experience and captures the danger and excitement of a turbulent period in English history. And as the advertising goes, Family fun, these underground caverns will reveal a secret Hastings as you explore its smuggling, bootlegging and gangland past. A themed experience with 75 life-size figures, you’ll walk through a 44m tunnel once used by the real smugglers of Hastings history. Concealed in their underground safe haven, smugglers stored goods such as alcohol, tobacco, paper, silk, sugar and spices here. You’ll visit the eerie, underground St. Clements Chapel. Be warned. The chapel is believed to be haunted. These caves also served as shelters in WWII air raids.